Taste Buds are the cells or group of cells which help in taste perception. 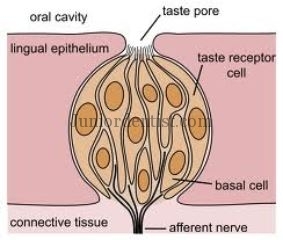 The location of Taste buds is mainly on the inner walls of the trough surrounding the vallate papilla, in the folds of the foliate papillae, on the posterior surface of epiglottis, and on some of the fungiform papillae at the tip and lateral borders of the tongue. Taste buds are absent on the filiform papillae. Taste perception is thought to be seen as different types of tastes can be felt in different parts of the Tongue, but it has not been proved because the taste buds in all areas of the tongue are similar to each other and their location does not change their taste perception.